As a mom I too know what it’s like to struggle with hypothyroidism. I did for many years! Pushing through fatigue every single day to be the best mom she can be has to be excruciatingly grueling, both physically and mentally. I can also only imagine what it’s like to be a couple struggling with infertility. The frustration must be overwhelming. Infertility treatments abound, yet rarely does the doctor check the patient for thyroid problems. The thyroid is a HUGE part of the fertility puzzle. Kim Schuette reveals the link between thyroid health, cholesterol, progesterone, and fertility. Plus, how a mother’s iodine levels can impact the IQ of her child. Be sure to stick around to the end, as GAPS Practitioner Toni Fairman steps in to discuss the importance of emotional healing. Bridgit Danner shares how low thyroid can be the “first domino” to fall with reproductive problems. You’ll also learn 15 foods that support your thyroid, liver, and gut (and a few foods to avoid). Katie the Wellness Mama tells her own personal story that led to her Hashimoto’s diagnosis. Find out the exact nutritional and supplemental protocol she is using to heal her thyroid. Plus, how she keeps her husband and kids on board with her program. Jen Wittman reveals her best tips for Managing Hypothyroidism and Motherhood. Learn how to deal with the fatigue, brain fog, and endless juggling act of motherhood. She also discusses the 5 things hypothyroid moms wish their friends and family understood. The guys will want to watch this one, too. Especially if you’re a guy who likes to “fix” things. 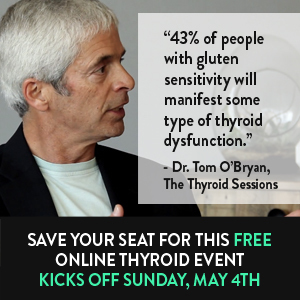 These talks will be posted to the Thyroid Sessions site TOMORROW (that’s Saturday) at 8am Pacific Time and will end Monday morning at the same time. Don’t forget, our third round of talks with Christa, Dr. Austin, Suzy, and Ben are still up and running. Their FREE 48-hour viewing period ends Saturday at 8am Pacific. Click the link above to watch them. 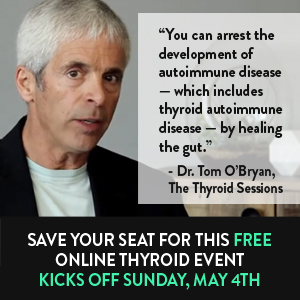 Get Lifetime Access to The Thyroid Sessions! Too busy to keep up with our viewing schedule? Or just want to have our thyroid interviews at your fingertips whenever you need them? You can get LIFETIME access to all 24 thyroid sessions when you order the Digital Access Pass. You’ll be able to log into your own private account, where you can stream or download every word of our event whenever you wish! Click here to learn more about the Digital Access Pass and our special Event Week price! See you at The Sessions..
And Happy Early Mother's Day to all the Moms!